FLORENCE, Ala. – The University of North Alabama Department of Geography will host the 14th annual UNA Geography Alumni Association (UNAGAA) conference Oct. 11-12, in Wesleyan Hall auditorium. The keynote speaker for this year’s conference is Dr. Joseph Kerski, education manager at ESRI. Kerski has worked with a California-based GIS software development company, was a 2018 TED Talk speaker on “The Whys of Where,” and is the author of seven books and 75 peer-reviewed journal publications. He will deliver the conference keynote speech in Wesleyan Hall auditorium, Oct. 12, at 10 a.m. The event is free for all UNA faculty, staff and students. New this year is a “Bring Your Own Device” GIS Workshop titled Web mapping applications using ArcGIS Online, conducted by Kerski. This workshop is also free to all UNA faculty, staff and students. The conference will also feature a live drone demo Oct. 11, at 3:15 p.m., designed to show students innovative mapping technologies using Unmanned Aerial Vehicles (UAVs). In addition to the keynote speech, the chair of UNA Geography Department, Dr. Francis Koti, will also provide a State of the Department Address Friday, Oct. 12, at 9:15 a.m. This two-day event will coincide with UNA’s homecoming week festivities, where UNA Geography alumni will recognize and present awards to students in various categories. 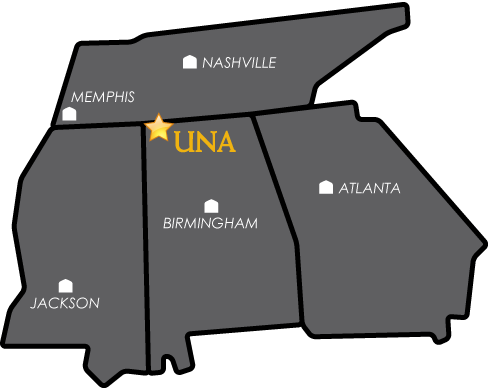 The UNAGAA is a professional organization with the goal of promoting and encouraging closer communication among alumni of UNA’s geography program and current geography faculty and students. This annual event allows the association to showcase its professional activities in addition to interacting and sharing industry experience with current geography majors. It is also an opportunity for the department to show its alums all the exciting things students are doing to prepare for their careers in the geospatial industry or in graduate school.